Book Drunk: Reviewed: Pippa's Cornish Dream by Debbie Johnson. 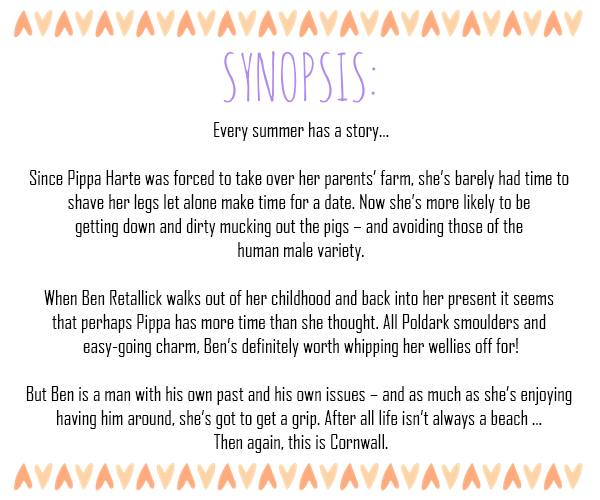 Reviewed: Pippa's Cornish Dream by Debbie Johnson. 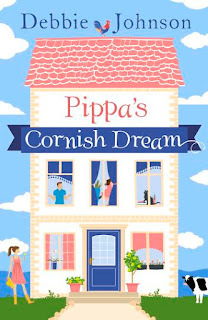 Pippa's Cornish Dream was published by HarperImpulse on July 2, 2015. Thanks to Debbie for sending me a copy of this book to review. You know when you read a book that just completely ticks every box for you? The gorgeous setting, the lovable characters, the humour contrasting with the touching story underneath… Pippa’s Cornish Dream was that for me. This was such a beautiful book, inside and out, and it was the kind of light, feel-good book that I love, except this one had more than a little heart and energy bursting through the pages. Pippa is a character that circumstance has forced her to mature well before her time. The tragic death of her parents when she was young saw her made to grow up instantly and with that bravery and spirit we learn Pippa has in abundance, she stepped up and became carer to her four siblings, Patrick, Daisy, Lily and Scotty. Not only that, she took over her parents’ farm and so she has a cast of animals to care for too, as well as a place to run and holidayers to take in. When Ben Retallick appears on the scene, a guy she has a very funny memory of from her past, Pippa starts to realise how good it feels when she can step away from the chaos of mothering duties just for a minute or two and relax, to let herself go a little. And it’s so lovely to see her character grow throughout this book, a book which I loved every second of. Pippa was such a likeable character. We’re introduced to her with great wit whilst she’s battling with a blocked toilet and then revelling in the success of managing to unblock it. It was refreshing to see a character who had so much to deal with but could still see the funny side to life. When she meets Ben again, you can see a bit of a change in her character and I loved seeing how she really came out of her shell when Ben was around, as she became more resonate of her age with an increased sense of freedom. I don’t think she necessarily suffered by having to look after her young family, you can tell she does a great job, but I couldn’t help but want for her to have a bit of a breather and a little chance to act like her age. I loved the dynamics between Pippa and Ben. From their banter to the attraction and chemistry between them, everything felt natural. Their dialogue was wonderfully real – flirty, funny and all very honest. There was such a big story behind Ben, one which felt quite surprising given how easy to like he was. Not that I needed another fictional guy to swoon over but I was quite happy to do so. Pippa was a strong character and I really loved how she gave him a chance – in fact, how she gave everyone a chance. She was so welcoming and understanding. There is more than just a heartwarming romance in Pippa’s Cornish Dream and Debbie really treat us to such a wonderful group of characters. I loved Pippa’s family and the relationships she had built with each member of her family. There were the funny antics little children bring, not to mention the chaos but Pippa knew how to handle them and you could see how loved and respected she was. My favourite character from her family was Patrick, Pippa’s teenage brother. He has his teenage issues and definitely knows how to get himself into trouble but when he became more responsible, I found him so easy to like. I really enjoyed the communication he had with Pippa and he had a softer, more caring side to him which was endearing. I loved getting to know all the characters in this book and there is such depth to the story. It felt effortlessly uplifting and it would also make a brilliant summer read with its stunning Cornwall location. Debbie’s descriptive writing, without getting carried away with being overly descriptive, really brought the setting to life and how I would have loved to have been there myself, spending the summer in such a dreamy location with the sun out and a book in hand… Pippa’s Cornish Dream was a beautifully addictive read, an easy read but also one to touch the heart a little too. Light-hearted yet touching summery read with a heart-warming romance. I just finished this while on holiday. I loved it too - great review!